Gino Cervi was a regular actor of PEPLUM films. This was one of his early ones. With a title like that, you know it's a comedy. 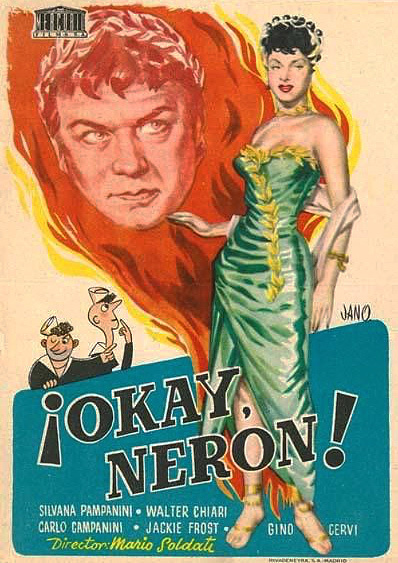 Not to be confused with Gino's other Nero film, NERO AND THE BURNING OF ROME (1953). Cervi also appeared in 'The Iron Crown' (1941), set in an indeterminate barbarian kingdom. Okay Nero used to show on TV when I was a kid. It's about two sailors who get transported back to the time of Nero. It was filmed on left over sets from Quo Vadis. Like most of these Sword and Sandal themed comedies, it's an acquired taste....which I never quite acquired.